Did you know that 80% of animals over 5 years of age have some form of dental disease? At Seneca Falls Veterinary hospital we utilize the latest techniques and modern equipment to provide the best dental care for your pet. 1. Physical examination. Every animal we see has an examination of the mouth performed as part of the general physical examination. We can see if there is obvious disease in the mouth.We will grade the severity of the dental disease we can see from 1-4 with one being minor dental problems and 4 being major dental problems. This gives us a rough idea of what we may need to do during a dental procedure. It is difficult to fully examine the mouth of an awake pet and we can only see the crowns of the teeth, NOT the roots. We will provide a rough estimate for the procedures we may need to do. We may find more problems during the dental procedure and in this case we will call you to discuss our findings and give you an exact cost for the procedure. 2. Preoperative bloodwork and examination. Any animal that receives general anesthesia at Seneca Falls Veterinary Hospital gets a full physical examination on the day of surgery and blood tests are performed to make sure the animal is in good health. 3. General anesthesia. Dentistry requires an animal to be under a general anesthetic. The patient is anesthetized and and IV catheter and anesthetic monitors are placed. A licensed Veterinary technician closely monitors the patient during the dental procedure. 4. Intraoral Radiology. We perform x-rays of the teeth for all patients undergoing a dental procedure. The only way to accurately evaluate the whole tooth is to x-ray. The crown is the only portion of the tooth visible-the root of the tooth is embedded in a socket in the jaw bone. In many cases the crown of the tooth may appear normal, but an x-ray of the tooth may reveal a problem with the root that requires treatment. 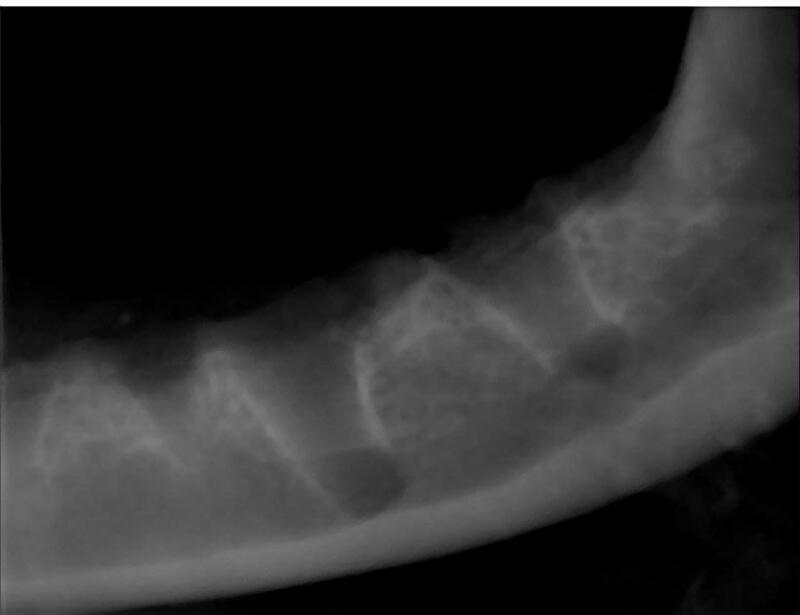 Once all of the teeth in the mouth have been x-rayed the treating veterinarian reviews the x-rays and decides on what therapy is required for each tooth. The images produced by the digital dental sensor are stored on a computer. 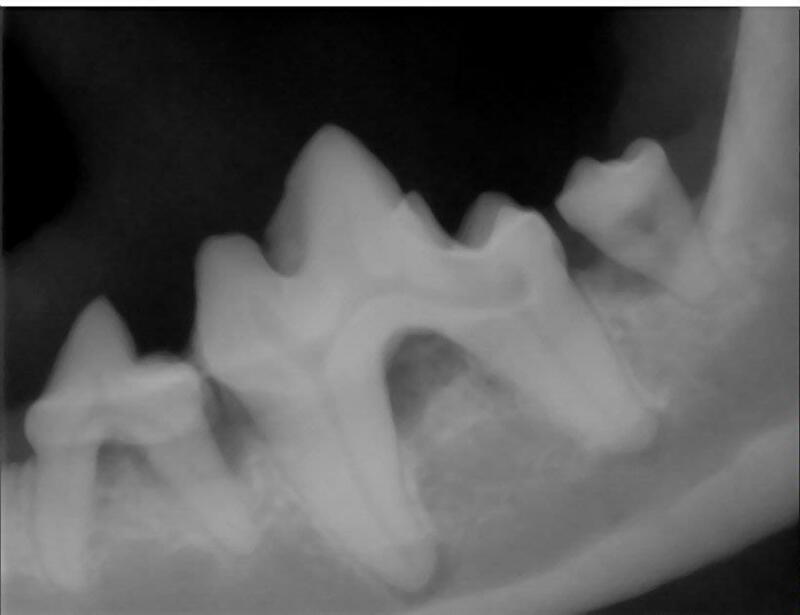 We use a digital dental x-ray system to x-ray each tooth. The x-ray is then read by the attending veterinarian. 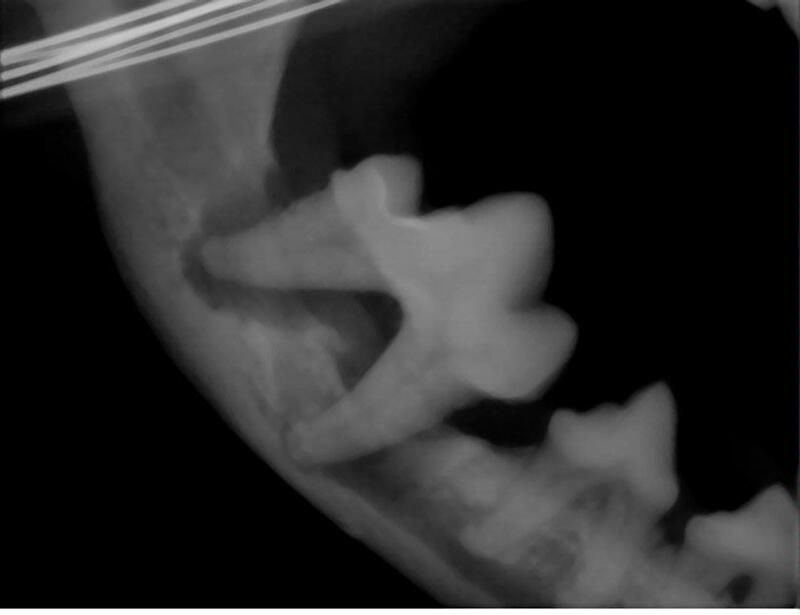 Here is an x-ray of a dogs lower jaw produced by our digital dental system. 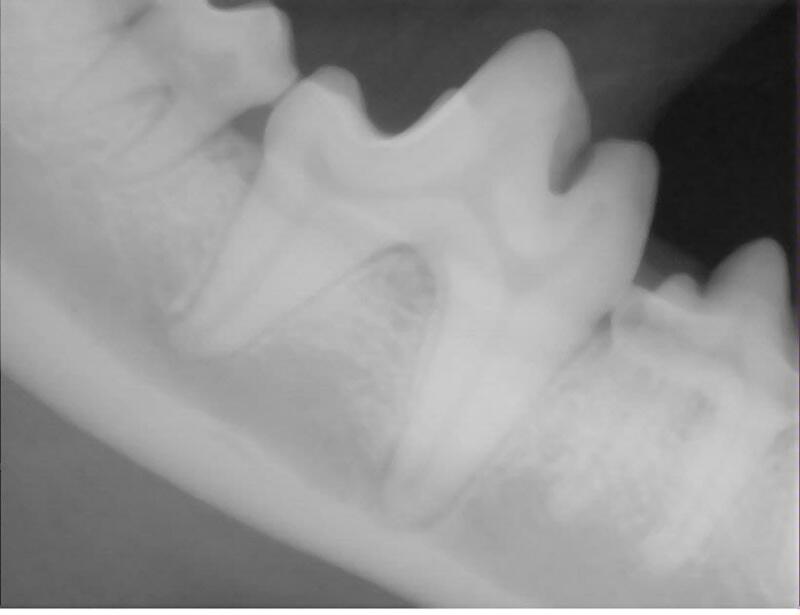 This is an x-ray of a dog with severe dental disease.You can see that the bone around the roots of the teeth has receded away from the tooth roots. These teeth will need to be removed. 5. Scaling. Scaling is the process where the tartar is removed from the teeth. Tartar is produced by bacteria that live on the teeth. Tartar causes inflammation of the gums (gingivitis) and this leads to recession of the gums, exposure of the tooth roots and eventually loss of the tooth. We remove the tartar with a combination of an ultrasonic scaler and hand scaling (just like the human dental hygienists). Removal of the tartar on the teeth is vital to improving the health of the mouth and it also removes the source of the patients halitosis (bad breath). 6. Periodontal probing. Once the teeth have been scaled the veterinarian examines each tooth individually with a periodontal probe. We use the probe to look for pockets. Pockets are caused by the gum losing its attachment to the tooth. Bacteria and tartar can accumulate in the pocket causing the wall of the tooth socket to erode and this leads to loosening of the tooth in the socket and eventually this leads to tooth loss. A small pocket may be cleaned and flushed, but a deep pocket usually requires that the affected tooth is removed. 7. Charting. The combination of radiology and periodontal probing allows us to accurately diagnose any problems with the teeth and formulate a treatment plan. We use a special chart to record our findings and treatments. The dental chart is used to accurately record findings and treatments. 8. Extractions. If we decide that a tooth cannot be saved it will be extracted. The first step is to place a local anesthetic block to block the tooth. Even though the patient is under an anesthetic removing a tooth can cause pain and the local block gives the patient immediate pain relief and the effect lasts for several hours to offer the patient post operative comfort. Once the block has taken effect we elevate a flap of gum tissue to expose the jaw bone. A high speed drill is used to cut the tooth into sections to allow for easier removal. The tooth is removed using instruments called elevators. Once the tooth is removed the socket is cleaned. A post extraction x-ray is taken to make sure that all of the roots have been removed. Once we have confirmed that there are no tooth root remnants we close over the socket using the gum flap. This prevents food material from becoming lodged in the empty socket. The flap is sutured with a fine absorbable suture. 9. Sealant. 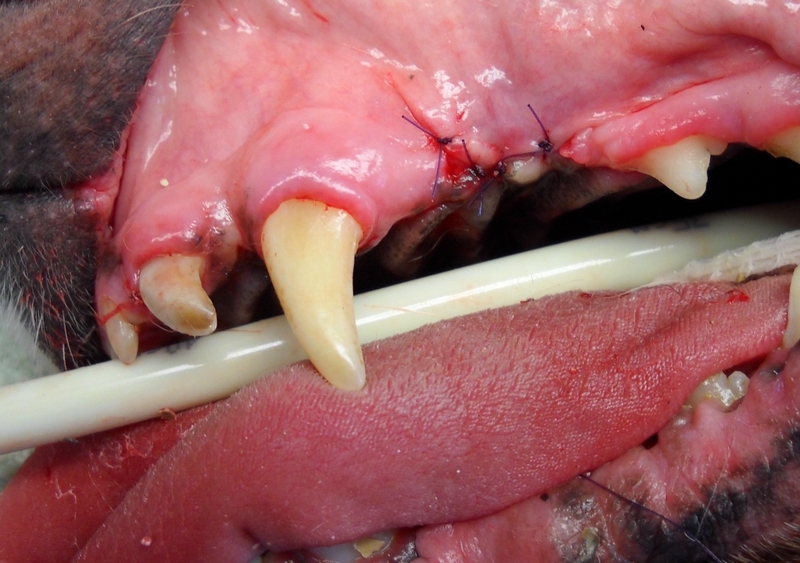 Once the scaling and treatment are completed we may apply a sealant to the teeth (ORAVET). This sealant helps to prevent bacteria from adhering to the teeth so it slows down the accumulation of bacteria and tartar on the teeth. It is applied under anesthesia initially and then a kit is sent home with the owner to apply once weekly. 10. Post operative care. We will give specific post operative instructions. This may include soft food and no toothbrushing for a few days. We will discuss treatment options designed to reduce the accumulation of tartar on the teeth. 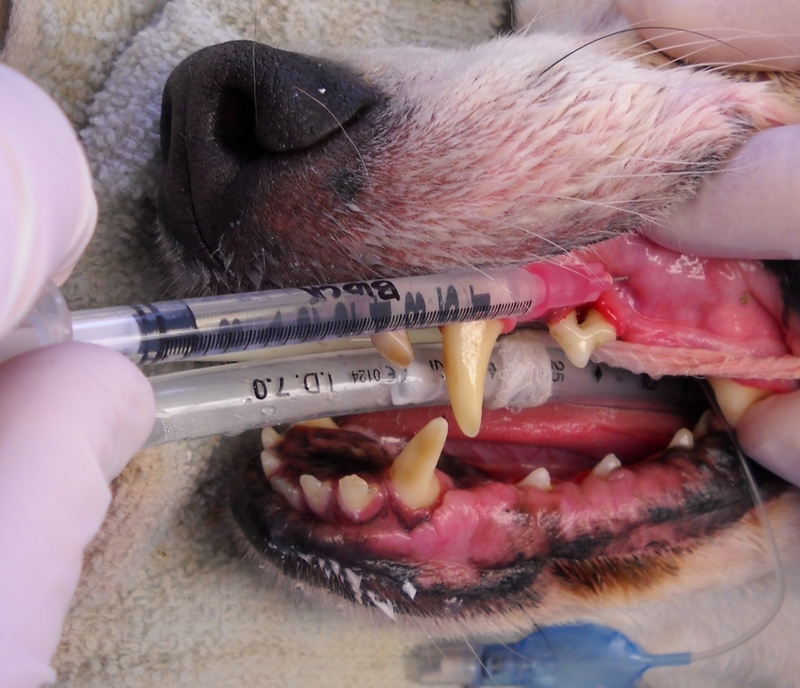 The treatment options may include a combination of toothbrushing, applying sealants, special dental diets (Hills t/d) and oral rinses.